‘Kill the Moon’ Review: What. Was. That. Oh my, what did just happen there? Truth be told, I spent most of ‘Kill the Moon’ thinking it was a not-so-great episode (I wrote the word “Meh” every couple of minutes), but then the episode got a great moment from Capaldi and suddenly, boom! Clara exploded and the story headed in a completely different direction. Basically, the plot saw Clara and the Doctor travelling to the Moon in 2049 with Clara’s student Courtney, whom I can only assume was used as an audience surrogate, and when I say audience I mean that part of the viewership that is under 15 –are there any kids actually watching Doctor Who nowadays? I don’t think children would understand half of it, and Capaldi is not as kid-friendly as Tennant or Smith. Anyway, the go to the Moon, which is causing a lot of trouble on Earth because it has “put on weight” and some astronauts are going to blow it up. For a plot so riveting, it was developed in a rather boring style. But thankfully, things started getting interesting when the Doctor revealed that the problem with the Moon was that it was actually an eggshell! There was a creature inside that was about to be born. Now the decision was to kill it and keep the Moon or to let it live, with the consequences that it would entail for our planet. In short, the Doctor disappears and lets them decide by themselves. The episode then delivered what I thought was going to be the best speech of ‘Kill the Moon’, as the Doctor takes everybody back to Earth to witness the birth of the Thingy. But no, that was not all, because back in the present day, Clara told him off, but not in a way maybe Amy Pond (to mention a recent one) would have. No, no, no. Clara was so pissed off that it actually scared me: I even thought that she would not show up anymore after this episode. I was dumbfounded, properly shocked. Is that why the episode itself was a bit dull at first, so that we would be taken aback at the ending? Nevertheless, next week we have a murder mystery! Or something similar. Not sure, we will have to wait and see. -There were some remarkable plot points, to be fair. There was an obvious parallelism between killing the Moon and the abortion debate. The Tumblr joke made me laugh (although, that astronaut was obviously already alive in 2014. There is no way her grandmother was a Tumblr user), and the mention that there is a female president. -Capaldi’s face when he announces that the Moon is an egg is priceless. I don’t get why people are liking this so much when it is actually a rubbish piece of writing. Theres so many plot-holes and pointless bits, the ending of Clara and The Doctor’s speech just falls apart. 1. Why did he bring Courtney? Even more so, why bother taking her into the T.A.R.D.I.S in the episode before? I thought The Doctor was supposed to be more dark and riveting than ‘oh hey come in my box and whoosh’. 2. Earth is in impending death because of the Moon and the waters are rising. If the Moon is destroyed then problems would only get worse. Even so, let’s say they ignore the fact Earth would be rumbled by no Moon, they send a suicide squad with a space shuttle from a museum and just works with a few touch-ups?! I mean… What?! It also annoys me that they steriotype teenagers as ‘lol woah im in a time machiene i wunder if it has wifi’ or ‘im on moon lets take picz and put it on tumblr!! !’ but I won’t get into that..
And astronaut captains can wear diamond earrings when they’re on a suicide mission to the moon. It’s funny because they could explain all these problems away if they knew how to write properly. Even if the explanation is BS, I’d be happy that they just addressed them. Have the Doctor say he figured it out and vanished in the middle not just so they could make the decision but so he could set up a device somewhere to hold the gravity in place so that when the egg hatched the tides wouldn’t wreck the planet. 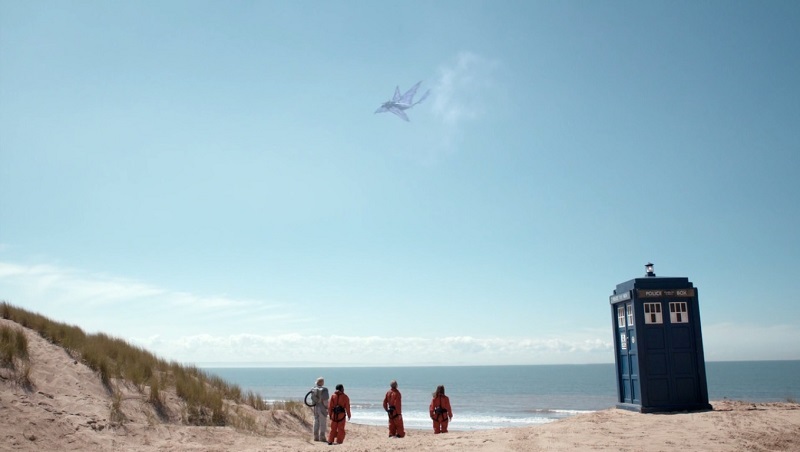 Say that the TARDIS is holding back the ocean that they’re standing beside but everywhere else they’re going nuts, something. Anything. I can relate the final argument between Clara and the Doctor to my feelings for this entire eighth season. I don’t feel respected as an audience member, or as a fan. I think Moffat is treating us as though we *are* little humans who are tiny, silly and predictable. Moffat was our friend before. He took the reigns of our show, and we thought we were safe in his hands. He was one of us, a fan who loved the show, he walked on our earth and breathed our air, and he made us his friend by writing all those wonderful episodes he wrote in the first four seasons. Now, as Clara told the Doctor, we want him to clear off and not to come back. She’s done, and a lot of us are done too. I’m very close to being finished with the show, but it’s true what Danny said, you’re never finshed with someone while you’re stil angry with them. I suppose that’s why we still watch, and why I will keep watching this season out, but I’m very very close to breaking like Clara, because I’m definitely angry with Steven Moffat. Was this scene a veiled rant from another writer to express his frustrations with the showrunner? Or was it a somewhat clever trolling attempt by the showrunner?